Remember that a typical LCC class will have 2 hours of homework for every 1 hour in class. How many credits of classes are you taking? Multiply that number by three and then add the number of hours you work each week to find your expected "school and job workload". If your answer is more than 40 then beware, and talk to your teachers for advice about resources and time-management. Math 20 is about turning free time into grade points. How much time it will take to learn the math depends upon how solid your Math 10 background is. But none of the topics in Math 20 are tricky or difficult. All topics can be learned if you spend enough time on homework and studying. And all topics will require at least a bit of time! In other words, students do not fail Math 20 because of the math topics. Those students who do fail have this happen because they run out of study time. Past terms have shown that roughly one-fifth of Math 20 students need to use time from two terms before the pass the class. For various reasons one term does not have enough hours. When this does happen it is regrettable, because the student must pay extra money to enroll in Math 20 twice. It might also mess up financial aid plans. But as a "Plan B" it does indeed work for many students. Most Math 20 students have many responsibilities besides their LCC classes. Unlike students studying at an Ivory Tower, they have jobs and kids, house repairs and car problems, parents and friends who need care. If you expect this term will be complicated by real-life burdens, please consider taking Math 20 pass/fail instead of for a letter grade. In some cases, ask your instructor if you can unofficially audit classes for a few weeks until a big life-changing event happens. True, we can admire the fortitude of a single parent with two jobs and four kids who enrolls in Math 20 despite having heart surgery scheduled in three weeks. But not all goals are worth risking tuition money. Please consider whether this term you will have the time it takes to succeed in Math 20. If you expect a busy term, think carefully. The deadline for tuition refunds is early in the term! But the deadline for re-enrolling is still weeks away. Visiting Office Hours (and the MRC) is useful for several helpful resources often otherwise unavailable. First, you can ask for hints on homework problems. Often you learn a lot when getting a hint and then figuring out the rest of the problem yourself. Second, you can ask for step-by-step answers to textbook problems. Our textbook does have a student solutions manual available, but not all students purchase that resource. Third, you can get help fixing test problem mistakes. This is crucial to prevent making the same mistakes on the final exam! 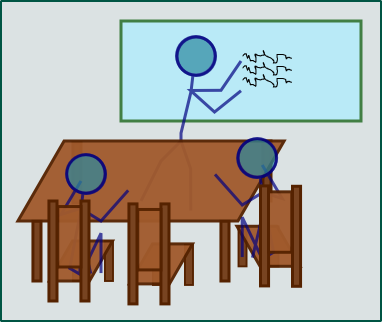 Finally, you can use the instructor (or tutor in the MRC) as a "sounding board" for when you try to explain something out loud. This is a great way to help learn math, even if it may seem a bit embarassing at first. No one has more math homework than math graduate students. How does someone survive so much math homework? By doing homework in a study group! Study groups are a strong predictor of Math 20 success. There is no difference in the rate of passing Math 20 when MyLane compares younger versus older students, or those who recently took Math 10 versus those to used a placement test to enter Math 20. But students who work in study groups do better! It is extremely rare for a student who is part of a study group of four or more students to fail Math 20. Building 16 even has a study room downstairs with a big table and a nice chalkboard that students can reserve by going to the Math Department office. There is no "right way" to do homework in groups. But for math there is a best way! What do math graduate students do when working in a group? Their routine is not very social. But it is efficient at learning the most from homework problems. 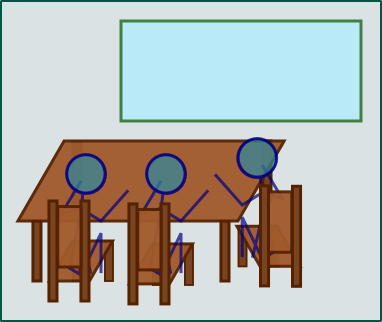 The graduate students begin by doing homework problems at a table. They do not talk. They work independently until someone gets stuck. When a student gets stuck, he or she moves from the table to the chalkboard and writes the steps to the difficult problem that he or she has done so far. The other students pay attention. If that problem is new to them they begin to work on it at the table. The student at the board waits for a response. Soon a second student will get up and go to the board. This new student will help by giving a hint about the next step, or by pointing out where a mistake was made. The first student may not agree. The two students may debate whether a suggestions is useful. Students still at the table also offer comments. Eventually the problem is solved. The students copy the correct answer to that difficult problem from the chalkboard. Someone erases the chalkboard. All the students go back to working by themselves at the table. As I mentioned before, this routine is not very social. The students avoid talking off-topic until all the homework is completed. (As math graduate students they have lots of homework to do.) When they do discuss a problem, it is either a brief suggestion that offers enough help, or a discussion that sounds almost like an argument. Most problems are done independently. So you may think this routine sounds like it is not much fun. In part, that is true! The group would have more fun if it was more social. But those math graduate students find learning math to be fun, even if socializing is postponed until later. This routine helps most, with most work done by yourself (but with company) and short interruptions discussing the trickiest yet most interesting parts of the homework. Mimic this routine if you wish. I hope learning math is fun for you too. But I also hope you are not so busy that off-topic conversation must be saved for afterwards! Knowing that most students who do fail Math 20 have this happen because they run out of study time, we should consider how to guard our study time! Sometimes dreadful and unavoidable things happen to people. There is often nothing we can do to prevent job loss, illness, family tragedy, cars dying, crime, etc. But even if we cannot prevent a crisis, we can and should prepare for bad things. This is especially true because the same preparations will aid us no matter what bad things happen. Perhaps the most significant preparation is to care for your support network. Even small problems can become huge crises for people without a support network. Only a few decades ago nearly everyone had a huge support network. Your family lived nearby. You knew everyone who lived within a few blocks. Your religious congregation helped members facing trouble. Your hobby created a circle of friends you saw often. The common trait shared by most students who fail Math 20 is the lack of a support network. Spend time with your friends. Find more friends whose lives are similar to yours! Have a hobby that involves meeting with people weekly or monthly! If you are religious, be at least somewhat active in a congregation. It might sound like an odd thing for a math instructor to say, but over the years I have known plenty of students who might have passed Math 20 if they spent less time on homework and more time knitting, volunteering, or getting to know other single parents at Bounce/NAAG/Library. The second preparation tip is a general matter of perspective. Do not imagine that any one thing will be all you need to succeed. This is a natural human tendency, but it causes people to needlessly ride an emotional roller coaster. Over the years I have known many students who fixate too much on a new math tutor they just found, a new job with better hours that they are about to start, a tax rebate they are about to receive, etc. It is nice when our lives improve. But new things usually come with new stresses, and you still have to do all the homework and all the studying. The third tip is a math-specific point. Understanding is better than routines, simple routines are better than complex ones. The more you understand why the math topics work the less you have to memorize how they work. Fourth, a practical item. Budget time for problems. Some people plan their week so full that they would always be busy even if no problems arise. When problems do appear, those people have no time to deal with them.